⚓ T48635 Asset Manager generating errors. Installed according to directions, seems to work well enough. 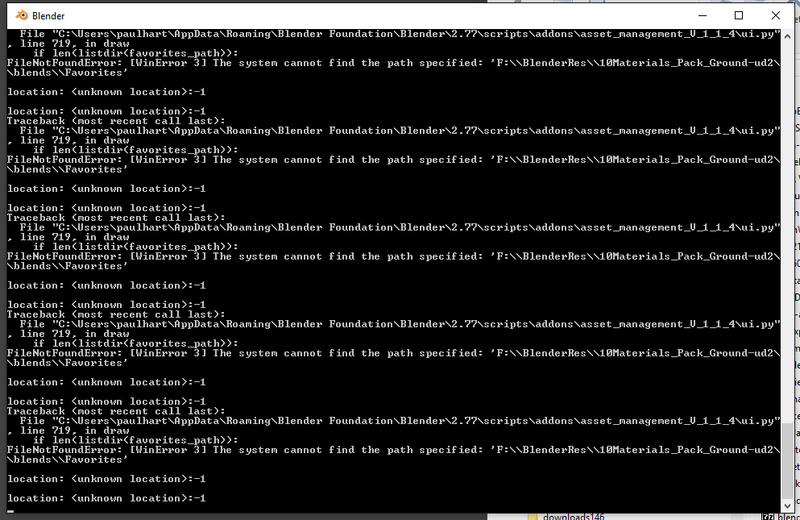 With the System Widow open, ongoing repeating error. I have now gone in and added directories, Favorites, icons, to each folder of Assets. Did not make a difference. Check the User Preferences and reset the Directory, no difference. Paul Hartsuyker (paulhart) raised the priority of this task from to Needs Triage by Developer. Paul Hartsuyker (paulhart) added a project: Blender Asset Manager. Paul Hartsuyker (paulhart) set Type to Bug. Paul Hartsuyker (paulhart) added a subscriber: Paul Hartsuyker (paulhart). This seems to be an addon from Blender Market  which we do not maintain. Please submit this error to actual developers of the addon.